"The Book of Mormon is a sacred text of the Latter Day Saint movement, which adherents believe contains writings of ancient prophets who lived on the American continent from approximately 2200 BC to AD 421. 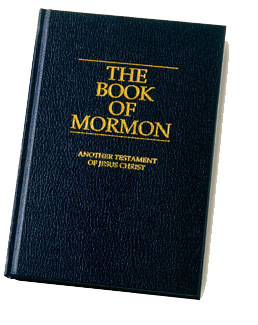 It was first published in March 1830 byJoseph Smith as "The Book of Mormon: An Account Written by the Hand of Mormon upon Plates Taken from the Plates of Nephi." According to Smith's account and the book's narrative, the Book of Mormon was originally written in otherwise unknown characters referred to as "reformed Egyptian" engraved on golden plates. Smith said that the last prophet to contribute to the book, a man named Moroni, buried it in a hill in present-day New York, then returned to earth in 1827 as an angel, revealing the location of the book to Smith, and instructing him to translate it into English for use in the restoration of Christ's true church in the latter days. Critics claim that it was fabricated by Smith, drawing on material and ideas from contemporary 19th-century works rather than translating an ancient record."